Lincoln Riley will enter his second year as the Sooners head coach with a new quarterback under center. Junior quarterback Kyler Murray (5'10, 195) threw three touchdowns and zero interceptions behind Baker Mayfield last season and will assume the responsibilities as the new signal-caller in Norman. Around Murray is running back Rodney Anderson (6'1, 220) and wide receivers CeeDee Lamb (6'2, 189) and Marquise Brown (5'10, 168). All three have made their respective position groups' preseason watch lists. On defense, junior linebacker Caleb Kelly (6'3, 231) moves to the inside linebacker position and will be asked to quarterback the defense. DC Mike Stoops' unit allowed opponents a 38-percent conversion rate on third downs in 2017 (fourth in the Big 12). 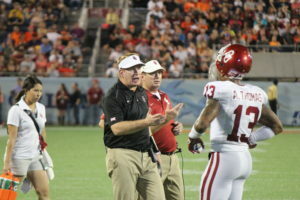 Defensive coordinator Mike Stoops' unit has to replace Ogbonnia Okoronkwo on the edge as well as five other starters. The defense's new faces could very well decide the fate of the Sooners in a conference that features some of the best offenses in all of college football. Powers, a senior interior offensive lineman, has experience at both the left guard and right guard positions. Powers has started 22 games over the last two seasons and was named to the All-Big 12 second team by conference coaches in 2017. With the exception of Kansas State's Dalton Risner, the other four linemen, who were named first team All-Big 12, have graduated on to the pros. Look for Powers to take the next step and lead the Sooners linemen in 2018. 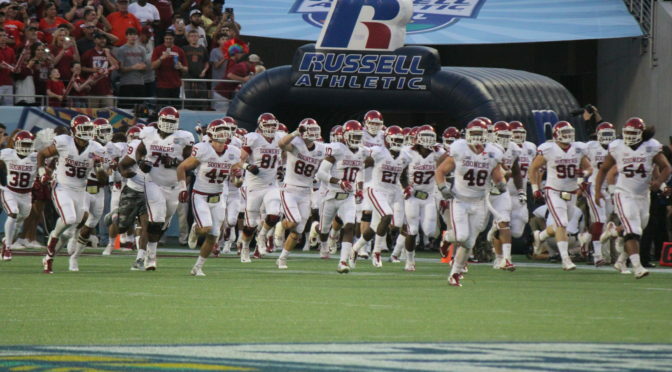 Oklahoma will face its stiffest competition during the last week of the regular season. West Virginia and Oklahoma are both favorites to win the Big 12 and their meeting in Morgantown could decide the conference's champion. Oklahoma defeated West Virginia last season in Norman 59-31. The Mountaineers haven't defeated the Sooners since 2008 and the last few contests haven't been close. Samia came to Oklahoma as a highly-regarded recruit and has lived up to the billing for the most part. The Academic All-Big 12 selection has started 34 games at three different positions (RG, LG, RT) in his first three years on campus. He's capable of finding color on the move when the team runs its plethora of power run game concepts. For him to take his game to another level, he needs to become more consistent handling inside movement by defensive ends (in pass protection). In addition, he has to stand his ground better when fighting pressure in 2018. The former River City Raiders (Calif.) product should once again challenge for all-conference honors in his final year in Norman. According to Draftnasty's Troy Jefferson, Oklahoma will fall twice against two rivals in 2018. Texas will defeat the Sooners in the Red River Showdown and West Virginia will end Oklahoma's regular season with another loss. The Sooners always replace talent with talent. While Jefferson is predicting a 10-win season, he is not forecasting a College Football Playoff Appearance.